Founder Katie Echeverry would spend her weekdays working as a pharmaceutical sales rep and her weekends trawling flea markets looking for vintage dresses to post on her online shop just for fun. Since true vintage items are not an easy find, on a whim Katie created some vintage-inspired dresses and before she could say retro-tastic. 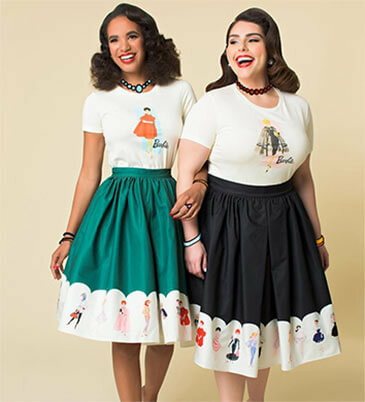 While her store, Unique Vintage, carries many fabulous retro designers, Katie had her own retro-inspired vision, this was the conception of the Unique Vintage brand. Including everything from gorgeous floral chiffon gowns straight out of "Mad Men" garden parties to retro Hollywood starlet inspired swimsuits to black wiggle dresses with applique details that Audrey Hepburn herself would fawn over. From pin up styles, vintage 1920s reproduction fashions, and stunning retro swimsuits, unique Vintage have got every vintage taste covered! If you’re looking for reproduction vintage pushing the barriers and introducing new licenced products, including the likes of Harry Potter and Barbie, Unique Vintage is for you.